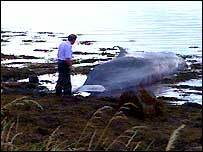 A whale stranded for two days in Larne Lough has been put down after it beached along the shore. 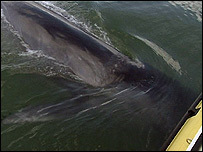 The young fin whale was said to have been exhausted and had an infection. The whale was about 12m in length and weighed upwards of 15 tonnes. A 300m exclusion zone had been imposed around the whale in an effort to get it to swim back out to sea. Vets had been on standby and a decision was taken to put the mammal down with the use of lethal injection. BBC rural affairs correspondent Martin Cassidy said: "The whale lay thrashing for about 40 minutes as the tide receded. "Members of the Environment and Heritage Service were there, a small crowd gathered and the vet who had been on stand-by was called in. "He administered three lethal injections into the whale and a few minutes later the vet tested the blowhole and eye of the whale and it was lifeless." The injections were administered by a vet from Belfast Zoo. Earlier, the Irish Whale and Dolphin Group - which has been trying to guide the whale back out to sea - said every effort had been made to prevent it from stranding on mudflats and to coax it out to open water. But on Thursday morning, they said they believed the whale should be "left to its own devices in the lough, without intervention". Originally thought to be a minke whale, the group said it was "most likely a fin whale", the second largest mammal on the planet. The group's website said: "This is the first record of a fin whale in Northern Irish waters since one stranded in Magilligan, County Derry, almost 100 years ago in 1907. "They are the second largest animal on the planet, second only to the blue whale. "Although this specimen is almost certainly a juvenile, our best estimates are that it is 35-40ft or 12m length and may weigh upwards of 15 tonnes. "No realistic human intervention is possible when dealing with animals of this size, in these situations." The animal had been swimming in tight circles, which experts said was a sign of confusion. Scientists believe the current heatwave may be contributing to unusually large numbers of whales and dolphins off the UK coastline.